When you purchase new cameras for your estate, you may be tempted to think that you are well on your way to securing your space, but cameras are just one pixel in the picture of security. In a world where surveillance is crucial in protecting assets and monitoring daily operations, where it would often be costly or impossible to have a person standing guard in every area of your business, a surveillance system that works together to keep your assets safe is indispensable. In this article we take a step back and look at surveillance as a whole from a beginner’s perspective. We know that cameras are not the sum of surveillance, so we will explore what an end-to-end surveillance system means, its key benefits and how your surveillance system really does the hard work for you. What does end-to-end surveillance mean? Creating a truly effective end-to-end surveillance system, means bringing together a mixture of different products that work together to make securing your assets more effective and easier. That basically means considering factors such as the cameras you’ll need for each area, infrastructure, PoE switches, storage and surveillance software to help you manage your cameras. Your IP cameras will be the eyes and ears of your surveillance system, so choosing the right camera for what you need to keep an eye on is crucial. An overwhelming number of surveillance cameras are available from consumer to professional business cameras, indoor and outdoor, vandal-proof, night and day, pan/tilt or fixed lens, or cameras with microphones and speaker output. So one of the most important things to consider before buying a surveillance camera is what you want to achieve with each camera you place. Is the goal to monitor a small or large area, to record details such as faces, or to give an overview of operations? Here are a few features to take note of before heading out to buy a surveillance camera. Firstly, note the video resolution, the higher the video resolution the better the image quality. Take note of the horizontal field of view or whether it can pan/tilt, as well as built-in infrared LEDs to let you see in the dark. Depending on the specific goal of the camera you could also consider whether it has motion or sound detection, a MicroSD card slot for on board storage and supports PoE (Power over Ethernet). It is important to consider the infrastructure required to link up your cameras. This goes hand-in-hand with considering the placement and amount of cameras that will be deployed and weighing it up with your budget. Installing a surveillance system for the first time can be costly, but if done correctly, the value of an effective surveillance system will quickly outweigh the costs incurred. Switches may not be the first thing that comes to mind when thinking of surveillance, but switches help a great deal to provide the best possible quality of surveillance traffic, saving on operation and infrastructure costs along with a host of other features. Important features to look for are PoE ports, surveillance VLAN and IEEE802.3az Energy Efficient Ethernet. PoE ports let you power other devices that support PoE over a single Ethernet cable. This means less cabling as you’ll only be running one cable to each camera, saving on infrastructure costs, as well as maintenance. A surveillance VLAN gives video traffic high priority and guarantees the quality of surveillance traffic thus saving businesses the added expenses required for dedicated hardware and facilities while IEEE802.3az Energy Efficient Ethernet means these switches consume less energy by cutting down on power consumption when port utilisation is low. 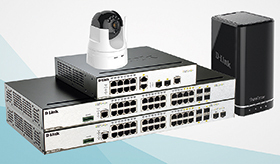 From the most simple to advanced network management, D-Link’s switches also provide important security functionality to protect your network from malicious attacks, so you’re safe on the outside and inside. If you are recording surveillance footage around the clock you’ll obviously need to store it somewhere where you can access it later. This is where network video recorders (NVRs) come in. Not only do they offer comprehensive video display, storage and management solutions, but also provide reliable remote monitoring functionality that means you can instantly view what is happening from ­wherever you are in the world. These useful devices also offer powerful event management which means you can control what should happen when a camera is triggered, while intelligent playback makes it easy to search through your recorded data to find notable events. It is also worthwhile to consider buying a NVR that has built-in PoE ports to help ease camera installation by providing power to PoE-enabled cameras. It is thus easy to understand the benefits of approaching surveillance from an end-to-end point of view, because it considers the role of each component and allows you to choose the best fit for your needs. In the same way that any team has specialised team members that make it function optimally, your surveillance system has components that work together to make up a truly effective surveillance system that looks after your assets 24/7. With a holistic, carefully considered surveillance system set up, you can enjoy the most advanced functionality and manageability that will save you time and money, not only during installation and maintenance, but also in terms of daily operational costs.